After spending a cold Thanksgiving with my family in Massachusetts and then spoiling my three nieces for ten days – in the cold – while my sister, Judy, and her husband took off for a getaway anniversary celebration in my Airstream, Max, I was more than ready to find some warmer weather! So, I’ve picked a southern compass heading and made my way down the coast to…Georgia! 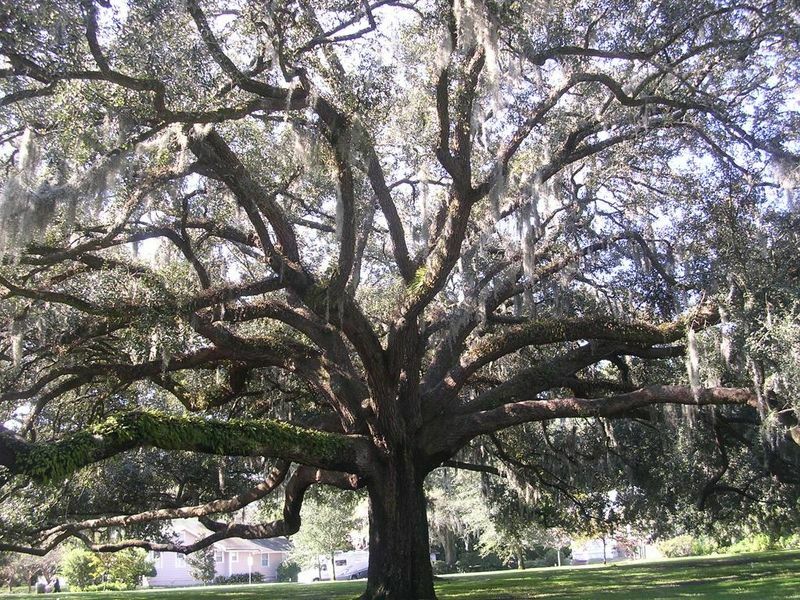 Beautiful oak tree with Spanish moss. St. Simon’s Island, to be exact. My dogs, Scamp and Rambler, have already given it a “two paws up” rating. That’s one of the really great things about being an RVer. If you don’t like the scenery and the weather, you’re just a tank of gas and a day or two from something more suited to your mood. I’ve always loved the southern coastal areas. You’ll find some of the most beautiful views in the world here. Large expanses of winter-brown tidal grass and the daily movement of the tidewater. And those trees! One of my favorite things in the whole world is the sight of a huge old live oak with long strands of its Spanish moss swaying in a gentle breeze. I was here for a few days when Scamp and Rambler made friends with another RV couple next door. The dogs readily embrace the role of “ambassadors” wherever we go, breaking the ice and making the introductions. The couple is Sharon and Phil, and they’ve been avid RVers since Phil retired from his job as a civil engineer a few years back and their children left the nest. My beautiful new wine chiller! I invited them over for dinner and conversation last night, and we sat under Max’s awning to enjoy the sunset. Sharon brought a shrimp appetizer that was to die for. I was able to offer the perfect complement while the charcoal heated up – a bottle of Chardonnay I’d been waiting to share with someone. It also gave me the chance to take the Christmas gift from my parents out for its maiden voyage. 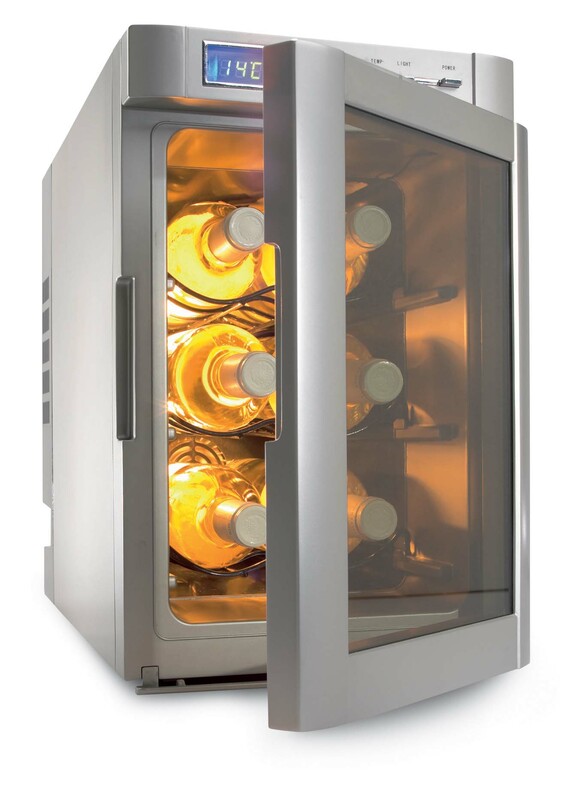 It’s a six-bottle wine chiller from Dometic. My folks know about my fondness anything Dometic, believe me. They know I like good wine and how much I enjoy impromptu gatherings in the evening. It was the perfect gift. After we toasted a gorgeous sunset – a riot of rose-colored clouds and a last gasp of orange yellow sun on the tidal grass – we raised our glasses once again to all those folks who have no idea what they’re missing if they’ve never experienced the RV life. Phil said they’d be pushing on the next day to spend a few days with their oldest daughter and her husband in Sarasota. We exchanged email addresses and promised to stay in touch. That’s another nice thing about life in an RV…the friends you make on the road. After turning down their request to kidnap Scamp and Rambler, I said good night and wished Sharon and Phil safe travel. They’d be gone in the morning before Scamp and Rambler could poke me with their cold noses. The temperature got up to around 70 yesterday and the forecast for today is about the same. Not sure, but I’m thinking I may want to find a place where it’s a little warmer still. After all, it takes a while to get rid of the chill I got in my bones while in Massachusetts last month!